A glove? A mitten? 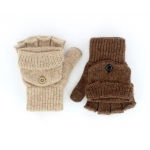 The best of both worlds, with the warmth of a mitten and the dexterity of a fingerless glove. The flap pulls back and is secured by a button, giving full access to fingers. The New England Alpaca Fiber Pool (NEAFP), which is where we send OUR fiber.